HONG KONG (MarketWatch) — In a surprise move, Singapore’s central bank said Thursday it would widen the trading range of its currency in order to send it higher, following the release of data showing economic growth is cooling. The move sent the Singapore dollar to a record high against the U.S. dollar. Singapore’s main monetary-policy tool is adjusting the trading range of its currency, rather than setting a policy interest rate. Singapore remains on course to be the Switzerland of Asia as foreign investors flood into its foreign exchange and equity markets. The move “represents a moderate tightening of policy ... and seems to reflect an assessment that the risk of higher inflation outweighs concerns about externally-driven weaker growth,” said RBC Capital Markets analysts in a note to clients. The move caught the markets unaware, with all economists polled in a separate Dow Jones survey predicting the Monetary Authority of Singapore would keep currency policy unchanged. The policy decision came as Singapore announced its economy shrank at a 19.8% annualized rate in the third quarter from the prior quarter, following on second-quarter growth of 27.3%. Economists had expected the latest data would point to a period of softness, though the decline was steeper than the 17.5% contraction tipped in a Dow Jones Newswires poll. However, compared with the year-earlier quarter, the island state’s economy expanded by 10.3%, the data showed. At its semi-annual meeting in April, the monetary authority said it would allow its currency to move in a stronger trading range. RBC said the policy shift at that time meant the authority was targeting an annual appreciation of about 2% to 3% from the mid-range of its unpublished trading band. Thursday’s announcement likely means the central bank has lifted its annual appreciation target to around 3% to 4% from the mid-range of the band, RBC said. RBC noted Singapore’s authorities were likely surprised at the pace of gains in its currency against the U.S. dollar since April’s announcement, adding that exports have remained buoyant regardless. The Singapore dollar rose 0.6% to 1.2946 per dollar on Thursday, compared to its previous close of $1.3026, according to Factset Research figures. IMO this is the first of the Asian countries to is beginning to give up on maintaining an artificially low currency. 2. Geopolitical: to get all the Asian ticks off the US's back by forcing them to revalue. In order to keep their currencies low, Asian countries have to print as much as Ben which generates a ton of inflation in their home countries (much more than in the US because their economies are not as weak). On top of that, expectations of these revaluations mean that international capital flows are going in one directions only: towards EM countries, thus exacerbating the inflation effect. Ben is very credibly threatening them with death by inflation and it looks like it's working. Don't know. Maybe it's the start of Asia waking up to the fact that the former top dog and pals have lost a few teeth and are a bit wobbly around the hind quarters? I notice the Yen went to 80 today despite all the boj's intervention over the past month too. US and the west generally failing or starting to fail as a benchmark? Working? America is slipping into third world country status and owes more money than it can ever repay. It's screwed. How is this 'working' for anyone? The beginning of real decoupling. What happens when the Us gets the jitters again as its financial policies threaten to break all the stops as the currency falls. Time to shout look over there at the Euro again? America is finished. Gold is showing the future. I am now nearly convinced that Europe and Japan have agreed at the CB level to play the game by letting the dollar fall. There seemed to me to be a change in how the market moved about two weeks ago that indicated some kind of loose coordination. It fits with this theory that Japan didn't intervene a second time. And if you hear EU politicians squirm and complain, it's because they haven't been told since they can't keep their mouths shut. would this be in part due to countries in the east moving away from the dollar as a reserve currency? could £2k an ounce be realistic in the next couple of years? What is threatening to cause total chaos (like we haven't seen yet) is Asian countries' currency manipulations. They are stopping the rebalancings that are now absolutely critical. If a Ben / ECB / Japan effort can stop this currency fixing business I am pretty sure whatever dismal situation we will find ourselves in as a result of GATT, financial crisis etc. will be better than the alternative. The alternative would be a full blown trade/real war. LOL. America the arch-currency manipulator and home of FRAUD Inc. telling other people what they should and shouldn't be doing? Bernanke et al should be fired at once. Half of Wall Street should be in prison. I've started reading quite a few people on the net saying that the Chinee currency level doesn't matter and that China's already revalued quite a lot. For info, here's the chart that shows the Chinese economic miracle in all its glory. My question: how was that not going to create enormous imbalances? Look at my previous post. Decoupling, specifically in order to block the US priting infinite quantities of money and buying up resources / companies it looks like contries are planning to effective ring fence the dollar and then execute normal trade relation shiips with other currencies (presumably without the capital controls and other means preventing dollar malinvestment or stelth theft by currency). Finance is the new form of warfare -- without the expense of a military overhead and an occupation against unwilling hosts. Sign up to stay up to date on the latest News & Politics headlines via email. The US can always repay. All it's debt is in dollars, and it can always print enough to pay it's debts to foreign bond holders. Dollars declining in value against other currencies helps countries to repay their debts in dollars. This decoupling concept is a non-starter. First of all it's mathematically impossible. 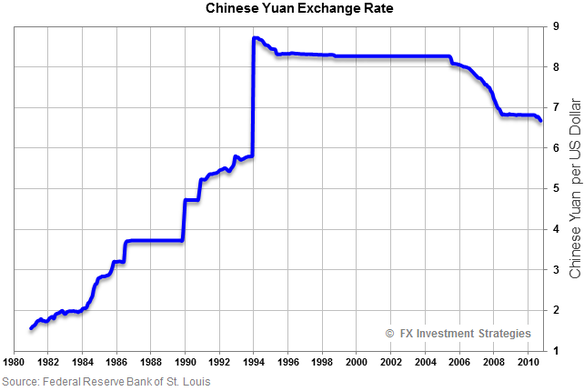 Secondly, the problem is Chinese predatory behaviour, not a US currency war. Yes, I read that article and it's quite interesting. What should stop them? Freely floating currencies so that the more they print the more their currency goes down and the less they can buy abroad. The floating currency system more or less works. Where it stops working is when it is abused by currency pegs. The current arrangement works too well for all involved, the Asian countries like a weak currency too much, and US cannot allow a rebalancing since it would make OIL too expensive which is an anathema to the American mindset. China is playing the same games on the Japan and the Yen, that the Japanese played on the dollar for decades. The hunter becoming the hunted etc. China was too smart to let themselves become the new patsies of the Japanese exporters, and it looks like the Japanese have accepted this. Western governments need to fight against this with tariffs, that is if they had any sense of decency and obligation to their peoples, instead of to international bankers. Dollar is king. Otherwise it's fight to survive. Tariffs will increase. Interesting to see how the EU deals with it. It's far worse than that - I remember seeing a documentary where they explained that in loads of countries US dollar is the unofficial (2nd)currency and Billions of people have their savings/old age fund in stacks of US Dollars (coz they don't trust the dictators banks) on most continents. They will all be wiped out and blame America! it can always print enough to pay it's debts to foreign bond holders. Who will buy the bonds (apart from the Fed, the UK and various Cayman entities )? Nonetheless, it is the only country where repayment is assured, and there will be no currency controls needed. The latter is critical. As the end game is reached, and currency controls are introduced around the world, wealth will migrate to the US dollar as it will be the only fluid currency stream left. Edit: Think of all fiat currency as the same pool of supply. When a country installs currency controls on international transactions (like Thailand has recently), they effectively take themselves out of the international markets. This decreases the total size of the fiat pool., thus requiring more from the survivors. Higher currency means cost of living is cheaper for the people. Not so very different to things we've seen here. The bogus inflation measure and low interest rates as the bubble rose. The regulated below-cost energy prices to consumers. The difference is Singapore's huge surplus. They, as a nation, can better afford to indulge themselves than some of us. Singapore also has about 10 percent growth and about 4 percent inflation, where traditionally they operate around 5 to 6 percent growth. They can afford to give away 3 or 4 percent growth to other economies, and this should also help to reduce the inflation rate as their currency appreciates.